Did I ever share this photo with you? I meant to. I found these old photos when I was tidying my garage a few months ago. 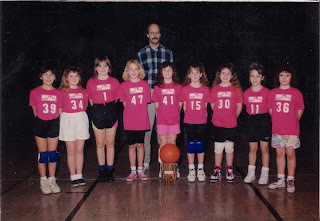 I have a big stack of sports photos just like this from when I was little, basketball, soccer, softball. I played it all, it seems. I loved looking at these photos, remembering a time where I belonged to something, was part of a team. I need that, it seems. To belong. It became my mission to locate all these girls I had this thing in common with 15 years ago (OK, closer to 20) and see how they're doing now. It was pretty easy, really. Facebook helped. I emailed one of the girls in this photo who wrote back to say she'd kept in contact with most of the others and she gave me some links to their myspace pages. I haven't yet emailed them. I know where they are now. A lot of them are married. Most still live in the same area. I like that idea. Living where you've grown up. I've never known what that feels like. The most disappointing thing about this project was not being able to find the person I most wanted to find. My original best friend, number 1 above. We met on the second day of third grade and we were inseperable for so long. We lived on the same street and every day after school, I was there, knocking at her door, 'can T come out to play?' and then 'What do you want to do?' 'I don't know, what do you want to do?' Oh, I miss it. I want those days back. But patience is a virtue, eh? I managed to track her down from T's younger's sister's friend who uses Facebook (and has an unusual name). She passed on T's phone number and the biggest thing standing in my way seems to be the time difference (8 hours). But I left a message on her machine, I'm sure we'll connect one of these days. And that makes me happier than I've been in awhile. I like it when the choice of 'should I/shouldn't I call' is so very simple and uncomplicated. And can only bring happy results. Enjoy your chance to say hello to the past. Well done on tracking so many down. I love Facebook, as it has allowed to catch up with so many people who played such big parts in my past. I hope you got the email with the two books. Let me know if you didn't. i went through that phase, of tracking people down, a couple of years back. How in the world did people do it before facebook? There is just a very small handful of people I can't find.